Well, I've been thinking about my kitchen accoutrements again. This is my mug. She has been with me, every morning, for almost 5 years now. I have known her - held her between my greedy, needy paws - longer than I have known my husband. Like a hockey player approaching the Stanley Cup tournament, I feel superstitious posting about her - I worry that she will crack under the pressure. What if tomorrow she breaks because today I gossiped about her? She looks benign enough (I mean, polka dots?) - but this robin's egg colored CHALICE - this venerable gives-me-the-shakes-when-I-see-it caffeine delivery vehicle is my morning muse. I wake - and - knowing she is not far, am willing to move - I schlep out of my dreadful, insomniac, pinch-faced haze - grabbing a sweatshirt, turning off the AC - hoping to sweat Tony from his slumber - I shouldn't be the only sleepless, suffering, sack of...well, anyways. I drag toward the kitchen, questionably conscious - arm raising forward, pointer-finger beginning to stretch into extended position - almost there - PUSH BUTTON - whirrrr, tick, tick - drizzzzzzzzle. The espresso shot begins. Let the crema ensue. I shall prevail. I am woman, hear me snore! 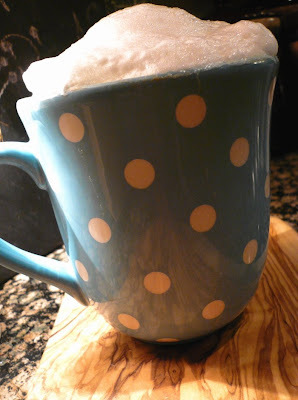 Add the vanilla syrup, steam the milk, froth excessively just because I can, pour into espresso shots, stir gently. Too hot, but sip anyways - ooooooh, baby, come to momma. I am RISEN. I cup both freezing paws around this gloriously over-sized mug - it fits perfectly and burns my skin a little. Bring it, mug-o-lovah. 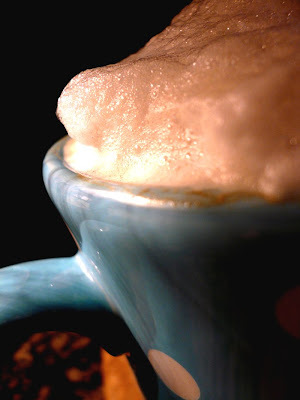 Sipping and savoring, I contemplate important global considerations, such as, how did I ever survive before my super-automatic espresso machine? Does Tony sleep late just to stick it to me? What was my dog dreaming about? Why am I "blog-thinking" in the middle of the night? Why is that dude at the bead store always such a jack to me? Is it because he is a dude, and working at a bead store? Why do I have 28 mugs (I counted) when I use just this one? What is that about? Um...you might be thinking...OCD, perhaps? Good point. I'll uh...look into that...again. I think it goes back to my obsession with kitchen accoutrements and somehow - artistically and aesthetically and experientially - certain objects just hook me. In other words, we bond - me and this mug. It's my one true mug. So, if you come to my house and see this gorgeous hunk of mugoliciousness - you should know not to use it. Or, touch it. Or, if you do touch it - then, touch it 7 times, put it away twice - then turn the espresso machine on and off, x 3. I'm getting a password protected thermostat! Oh,god. I am just dyin' of laughter. "Does Tony sleep late just to stick it to me?" I can't count the mornings I've loudly clattered about the house cleaning and picking up while my husband snoozes! And all those morning thoughts, where do they come from? Sometimes, you can get a certain kind of clarity in the morning, before the caffeine heals you and makes you whole. I mean, it's like getting a pinhole view into our subconscious...and, god, do we really want to go there? Great photos!!! firefly - EXACTLY! Those morning thoughts are like a worm-hole into which don't necessarily want to peek, no? You hit it on the head, my friend! Thank you. This is hilarious! The paragraph of random questions had me dying laughing. I am going to add Velvet Lava to my links. The "dude" in a bead store, omg! What a classic early morning stream of consciousness. Awesome. OMG... I finally found someone who feels about their mug, the way I do! And my morning coffee! I have scrapbooked my mug more times than I'd like to admit. I did this one for a scrapbooker's challenge, but check it out! My cup is polka dotted too!!! Great blog, by the way! Keeps me entertained every time I read it. I wish not approve on it. I over precise post. Expressly the title-deed attracted me to be familiar with the intact story.